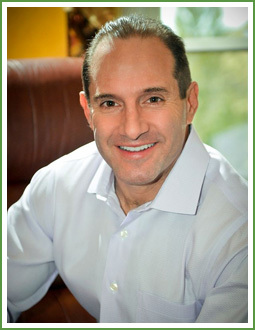 In 2010, health enthusiast, father, and entrepreneur Dave Waldman went on a mission to get into the best shape of his life. He created a comprehensive exercise program and clean diet composed of minimally processed wholesome foods including oatmeal, whole grain cereals, sweet potatoes, and plain yogurt. While Dave (and his family) started eating a lot healthier, they soon grew bored with the lack of flavors. So he started looking for ways to make their food more enticing. Unfortunately, he discovered that most of the products on supermarket shelves were either loaded with sugar or filled with unhealthy artificial sweeteners, colors, flavors, and preservatives. At first, Dave experimented with powdered fruit, ground peanuts, and other natural spices and sweeteners. He just “sprinkled a little bit here and a little bit there” to add some variety and real fruit flavor to his meals and healthy snacks. When he shared his great tasting fruit-based recipes with family, friends, and neighbors, he got rave reviews and knew he was on to something big. Dave went to work formulating a line of gourmet fruit based sweeteners that contained absolutely no controversial, chemically derived ingredients of any kind. His goal was to create an all natural sweetener, dessert topping, and snack so consumers could add a little natural fruit-flavored goodness to their favorite breakfast foods, healthy snacks, and meals without sacrificing health and nutrition. In short, he wanted a product everyone would feel good about eating. Before long, Dave arrived at a great-tasting, all natural blend of pure fruit and other premium powdered ingredients that contained no artificial sweeteners, flavors, colors, preservatives, or high fructose corn syrup. 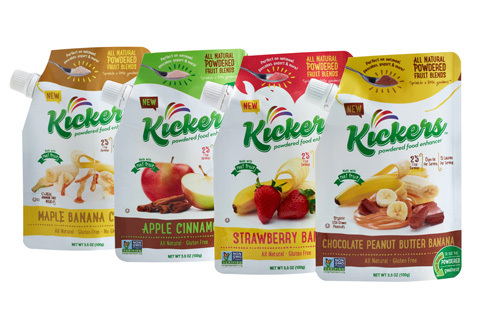 Kickers® powdered fruit blends was born! Kickers® powdered fruit blends is made with pure and simple ingredients, including real, antioxidant rich fruit powders and spices. In fact, pure fruit is always the first ingredient in Kickers. So when you’re savoring the sweet tropical taste of strawberries and bananas after sprinkling Kickers into your mouth or onto your pancakes or oatmeal, you’re tasting real strawberries and bananas–not imitation or “natural fruit-flavored” additives. Other ingredients in our four amazing flavors include crisp apples, rich cocoa, hormone-free milk, natural cinnamon, delicious vanilla bean, and organic ground peanuts. Convenient, controllable, and ready to use, Kickers are NON-GMO, gluten-free, kosher, low fat or fat free and contain either 15 or 20 calories per 1 teaspoon serving. And for just a little bit of natural sweetness, they contain the finest all natural cane and maple sugars – not the cheap, highly processed beet sugar or high fructose corn syrups often found in everyday foods. They come in a 25 serving family sized spouted pouch and a double serving stick pack so you can take Kickers with you 'on the go'! Try Kickers powdered fruit blends today and Sprinkle a Little Goodness® onto pancakes, oatmeal, popcorn, cereal, ice cream, yogurt, smoothies, protein drinks, cottage cheese, toast, and baking mixes or straight out of the pouch for a delicious all natural fruit snack!